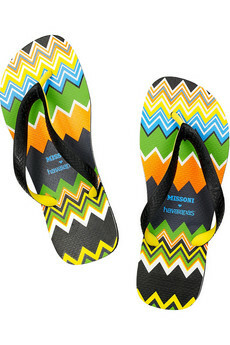 Today's So Shoe Me is the Missoni + Havaianas Zigzag-Print rubber Flip-Flops, $60, available at Net-a-Porter. Flip-Flops gone luxe. The summer standby is jolted into another style level with Missoni's signature bright zigzag print and Havaianas superbly made classic. Complete with a crochet knit shoe bag (which can also double as a small purse) this sandal is ready for the beach, sun and all the denim cut offs you can throw at it. 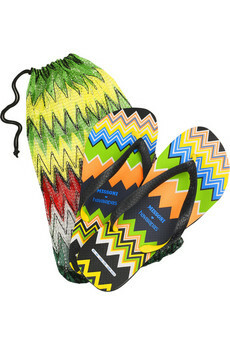 Never a style flop the iconic Missoni zigzag stripes are the perfect detail to peek out of your high-end Havaianas. Pair these bright summertime staple with a pair of cut off shorts, a colored Kain tee and bright Wayfarers for chic summer style. 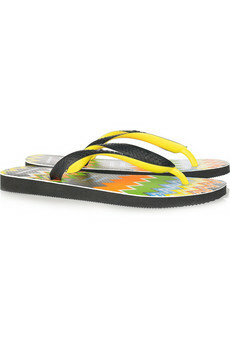 Be sure to check out the Havaianas Pop-Up Store in Chicago June 30-July31, 2011 (Thursday-Sunday 11am-7pm). Located near North Avenue Beach at 1600 North Lake Shore Drive. The grand opening party is on June 30 where there will be drinks, entertainment and the ability to customize your own pair of Havaianas. For more info check out their official Facebook Page. So Shoe Me a pair of not so basic flip-flops that bring Missoni's signature bright zigzag stripes to the everyday summer flip-flop for an easy going style onlookers will flip for.